Tina's Creative Studio: ESAD Blog Hop Starts Tomorrow! ESAD Blog Hop Starts Tomorrow! 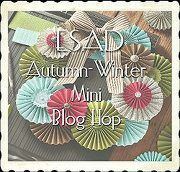 Be sure to visit my blog tomorrow for the Autumn-Winter Mini (catalogue) Blog Hop! There will be lots of gorgeous projects showcasing the absolutely fabulous new products in the new Autumn Winter Mini Catatlogue, which become available for order from tomorrow. No fooling!